Timberline Resources Corporation (OTCQB: TLRS; TSX-V: TBR) ("Timberline" or the "Company") today announced that it drilled 46.5 feet (14.2 meters) grading 1.20% copper, 0.31% molybdenum, 25.5 g/t silver, and 0.126 g/t gold in CCEC 18-02, the first core hole drilled at the Elder Creek porphyry copper-molybdenum project in Nevada. This intercept is the first drill test within the central portion of a 2.5 mile (4 km)-wide multi-stage hydrothermal system. 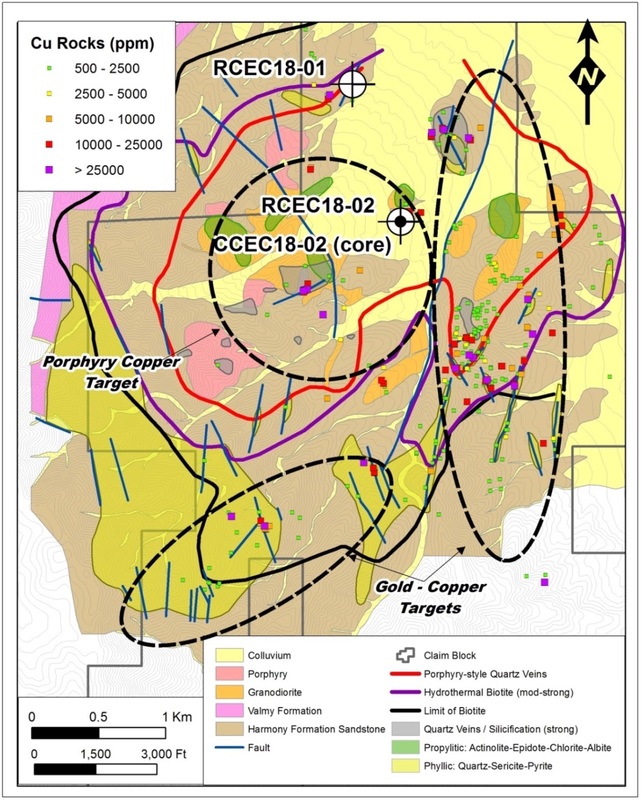 Hole RCEC 18-01, located 3,250 feet (1 km) to the north and previously reported, contains 0.21% copper over its entire 500 foot (152 m) length, including 0.44% copper over 110 feet (34 m), and bottomed in strong mineralization. Core hole CCEC18-02 (Figure 1) was drilled vertically to a depth of 1,497 feet (456.4 m). It intercepted pervasively altered hornfels (after Harmony Formation shale and arkosic sandstones), feldspar porphyry intrusive rocks and hydrothermal breccias. 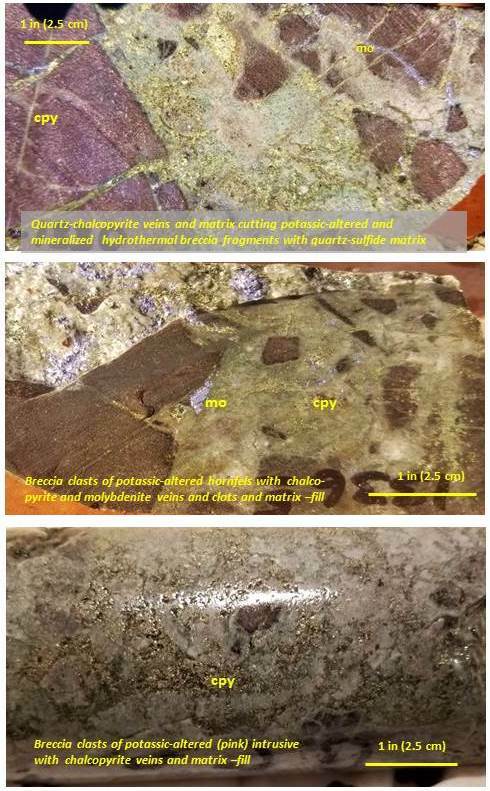 The cross-cutting textures and breccias reflect multiple, overprinting events including emplacement of copper and molybdenum sulphides(see press release dated October 19, 2018 at http://timberlineresources.co/press-releases/). The chalcopyrite and molybdenite are concentrated (typically 2-6%) from 1,313.5 - 1,360 feet (400.5 - 414.6 meters)(Table 1), where they occur primarily within veins and the quartz-sulphide matrix to breccia which cross-cuts potassic-altered hornfels and associated porphyritic intrusions (Figure 2). Assays for the upper portion of the hole are pending. Mineralization in CCEC18-02 is distinctly polymetallic (Cu-Mo-Au-Ag-Re)(Table 2) compared to primarily copper in reverse-circulation ("RC") drill hole RCEC18-01, which is located 1 km to the north-northwest at the Valmy copper area (Figure 1). RCEC18-01 intersected 110 feet (34 meters) of 0.44% copper as chalcocite within a near-surface, cross-cutting, altered porphyritic intrusion. The chalcocite mineralization occurs within a broader interval (500 feet; 152 meters) of 0.21% copper (see press release dated September 27, 2018), much of which is oxidized. Steven Osterberg, Timberline's President and CEO commented, "The excellent drill hole intercepts, combined with the pervasive hydrothermal alteration, extensive stockwork veining, and magnetics data, clearly document the very large scale of the Elder Creek porphyry system that we are just beginning to drill test. 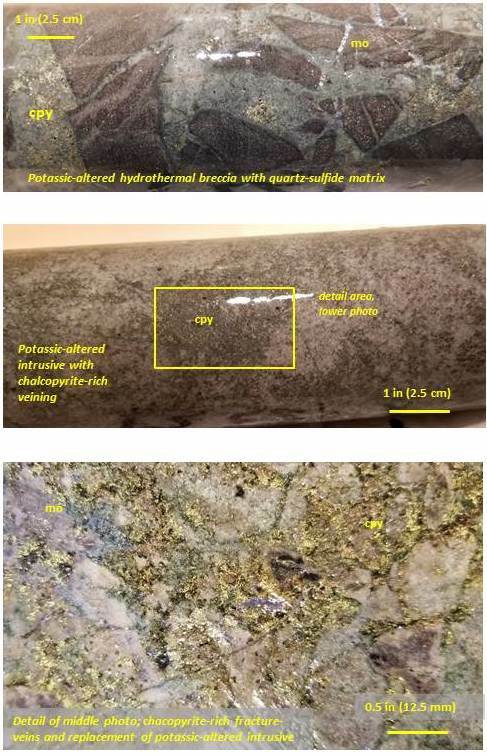 We are particularly excited to see the well-mineralized copper-molydenum breccia along with associated precious metals as further evidence of cross-cutting, multiple emplacement events as expected in major porphyry systems. Our focus now is to identify a large source of these mineralized emplacements. We have mobilized a geophysical crew to conduct induced polarization and resistivity surveys over the large target area." 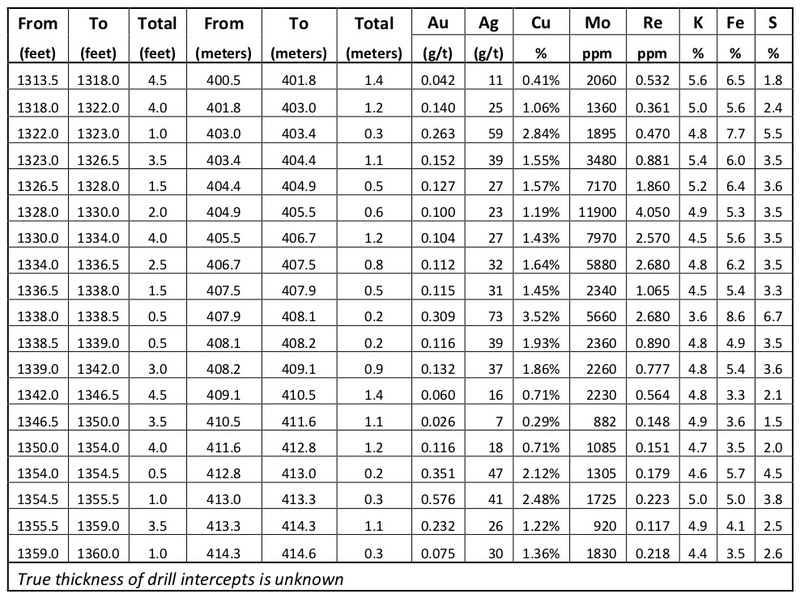 Assays from the mineralized hydrothermal breccia zone show general consistency and enrichment in rhenium, potassium, iron, and sulfur (Table 2). Rhenium is generally associated with molybdenum, potassium is thought to reflect intense potassic (biotite and potassium feldspar) alteration, and iron and sulfur are associated with abundant pyrite and chalcopyrite. These characteristics suggest that a robust, multi-staged mineralizing system exists at Elder Creek. The company has contracted Zonge Geophysics of Reno, Nevada to complete a 10 km Induced Polarization (IP)/Resistivity survey at Elder Creek. An orientation line will be completed over the location of drill core hole CCEC18-02, along with off-set lines across the 3 km diameter system. The survey will characterize the rocks for signatures associated with concentration of sulfides (IP), associated silicification (Resistivity) as hydrothermal alteration, and identification of major fault zones within the project area. 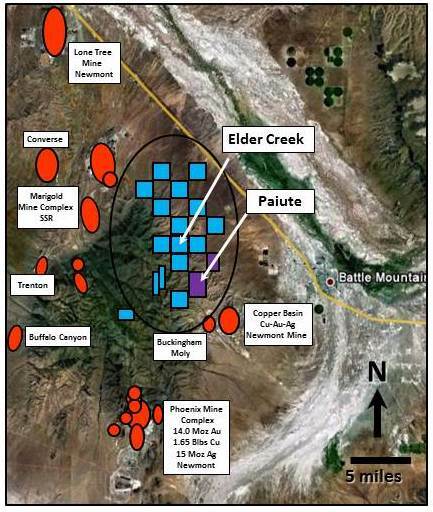 Timberline's Elder Creek copper-gold, and adjacent Paiute properties lie within the prolific Battle Mountain District of Nevada (Figure 3), approximately 11 miles (18 km) north of Newmont's Phoenix mining complex. Data compiled from over 40-plus years of exploration on the property includes only limited shallow, historic drilling in the pronounced magnetic low (Figure 4), and only shallow drilling along the north and northeastern magnetic zone targeted primarily at gold. Geologic and geophysical characteristics, and rock geochemical sampling results evident at Elder Creek (see press release dated June 18, 2018 at http://timberlineresources.co/press-releases/) are common to major porphyry copper deposits. Three primary target areas have been identified to date at Elder Creek. Figure 4. Elder Creek Historic Airborne Total Field Magnetics with Exploration Target Areas and 2018 Drill Holes. Timberline has the right to acquire a 65% interest in the 16 square mile (41 km2) Elder Creek property by spending US$5.1 million over 6 years through an earn-in joint venture agreement with McEwen Mining Inc. (see new release dated May 24, 2018 at http://timberlineresources.co/press-releases/). 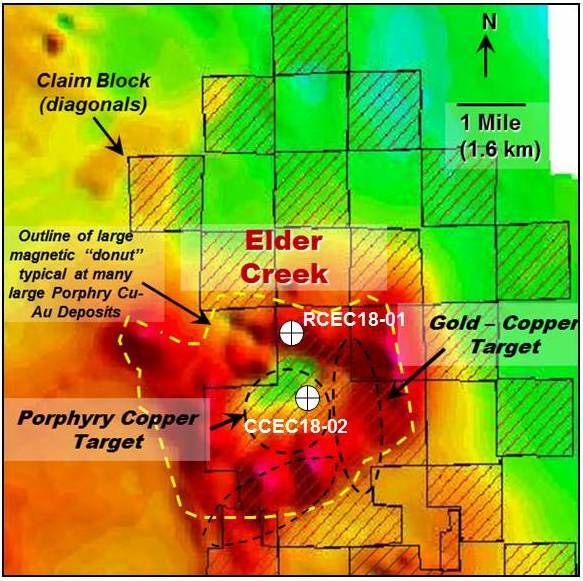 Further technical details of the Company's Elder Creek project may be viewed at: http://timberlineresources.co/projects/ElderCreek/. Collection of drill core samples was completed under the supervision of a Company representative. Core was transported by the Company's Qualified Person to Range Front Geologic in Elko, NV where it was cut. Sampling was completed by a Company representative. After preparation of the samples, blind certified standard reference materials and blanks were inserted into each sample batch which was transported to ALS in Nevada for analyses. Samples were assayed for gold by Fire Assay of a 30 gram (1 assay ton) charge with an AA finish (ALS code Au-AA23). Samples were also assayed for a 48 multi-element using four acid ICP-MS (code ME-MS61). "Over-limits" were re-assayed using 4-acid Aqua regia digestion and ICP or AAS finish (code Cu-OG62). Steven Osterberg, Ph.D., P.G., Timberline's President and Chief Executive Officer, is a Qualified Person as defined by National Instrument 43-101 and has reviewed and approved the technical contents of this release. Mr. Osterberg is not considered independent of the Company as defined in Section 1.5 of NI 43-101. Drill intercepts are reported as drill thicknesses; true widths of intercepts are unknown. Timberline Resources Corporation is focused on advancing district-scale gold exploration and development projects in Nevada. These include its 23 square-mile Eureka property, comprising the Lookout Mountain, Windfall, and Oswego projects which lie along three separate structural stratigraphic trends defined by distinct geochemical gold anomalies, as well as being operator of both the Paiute joint venture project with a subsidiary of Barrick Gold, and the Elder Creek joint venture with McEwen Mining. All of these properties lie on the prolific Battle Mountain-Eureka gold trend. Timberline also owns the Seven Troughs property in Northern Nevada, which is one of the state's highest-grade former producers. Timberline has increased its owned and controlled mineral rights in Nevada to over 43 square miles (27,500 acres). Detailed maps and NI 43-101 estimated resource information for the Eureka property may be viewed at http://timberlineresources.co/. Timberline is listed on the OTCQB where it trades under the symbol "TLRS" and on the TSX Venture Exchange where it trades under the symbol "TBR". Statements contained herein that are not based upon current or historical fact are forward-looking in nature and constitute forward-looking statements within the meaning of Section 27A of the Securities Act of 1933 and Section 21E of the Securities Exchange Act of 1934. Such forward-looking statements reflect the Company's expectations about its future operating results, performance and opportunities that involve substantial risks and uncertainties. These include, but are not limited to, statements regarding the advancement of projects, and exploration potential. When used herein, the words "anticipate," "believe," "estimate," "upcoming," "plan," ''target", "intend" and "expect" and similar expressions, as they relate to Timberline Resources Corporation, its subsidiaries, or its management, are intended to identify such forward-looking statements. These forward-looking statements are based on information currently available to the Company and are subject to a number of risks, uncertainties, and other factors that could cause the Company's actual results, performance, prospects, and opportunities to differ materially from those expressed in, or implied by, these forward-looking statements. There are no assurances that the Company will complete the earn-in on the Elder Creek project as contemplated or at all. Factors that could cause or contribute to risks involving forward-looking statements include, but are not limited to, changes in the Company's business and other factors, including risk factors discussed in the Company's Form 10-Q for the quarter ended June 30, 2018. Except as required by law, the Company does not undertake any obligation to release publicly any revisions to any forward-looking statements.